If you have any trouble with MetroFax or, like I did, need a different service (I needed HIPPA compliance), THEY WILL NOT LET YOU PORT YOUR NUMBER OUT. This is a huge problem for small businesses as you would then need to either stick with their service or change your fax number with every single client, which is now my nightmare as I suddenly need HIPPA compliance. Their solution was to try and send me to eCorporate fax, which charges 4xs the industry standard for HIPPA compliant fax for small business. Don’t do it. Really. Don’t do it. Love the service since day 1. Has 3 things that made me love it, reliability, organization, and mobility. Using Metrofax is effortless. They put in the hard work and all I do is click the buttons and is also quite reasonably affordable. Metrofax has given me unreal and easy to use faxing service. I can send out and receive multiple faxes at a time, no more jams, no more buying paper. I was got a toll-free number which business. MetroFax replaces old-fashioned faxes that require expensive toner and paper with an on-demand fax service. 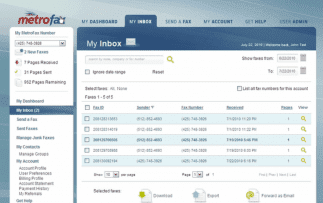 MetroFax is designed to be scalable to have as many fax numbers needed, or just one. 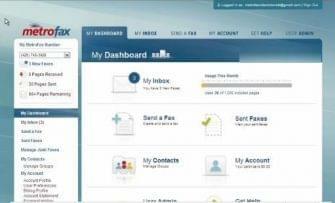 Subscribers can send or receive faxes through their email, with desktop or smartphone apps, or from the web portal. Subscribers can send and receive multiple faxes simultaneously. MetroFax’s parent company, J2, also owns the VoIP provider eVoice and the online storage provider KeepItSafe, among other companies. US-based phone support is available Monday-Friday 9AM to 10PM Eastern Time. Email support, web ticket support, and helpful downloads are available as well. Essential: $6,63/mo with yearly contract, 500 $0.03c add’l pages. From the same company that brings you eFax, MetroFax is a better value than its sister company. MetroFax serves large companies, and the service scales up well, even if you have a large organization that wants to give every employee their own number. What Do You Think of MetroFax?